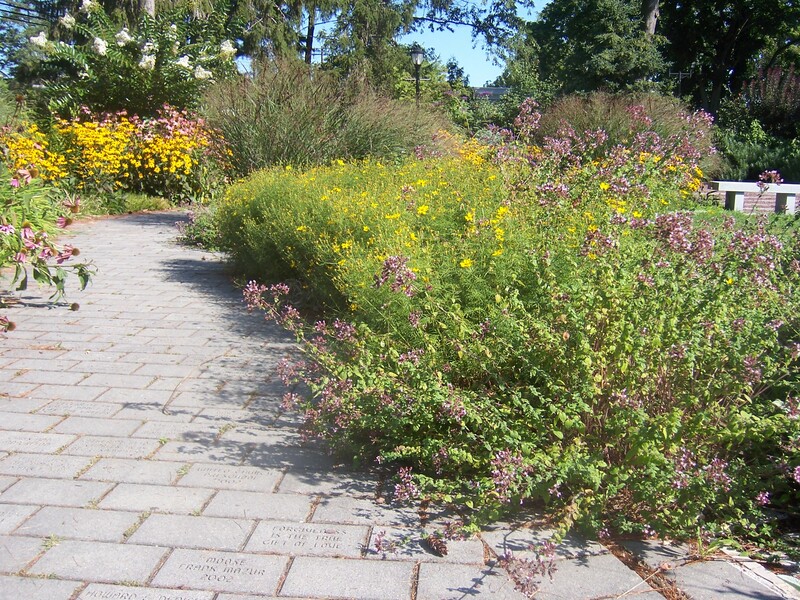 The path leading to the Peace Labyrinth. The Peace Labyrinth at the Common Ground Garden in Sayville, NY. to create something positive for the larger community. As more and more people and local organizations became involved, and with the help of fundraising, the little-used Rotary Park became a centerpiece for all. Today, the garden welcomes visitors to enjoy yoga, concerts, and movies. 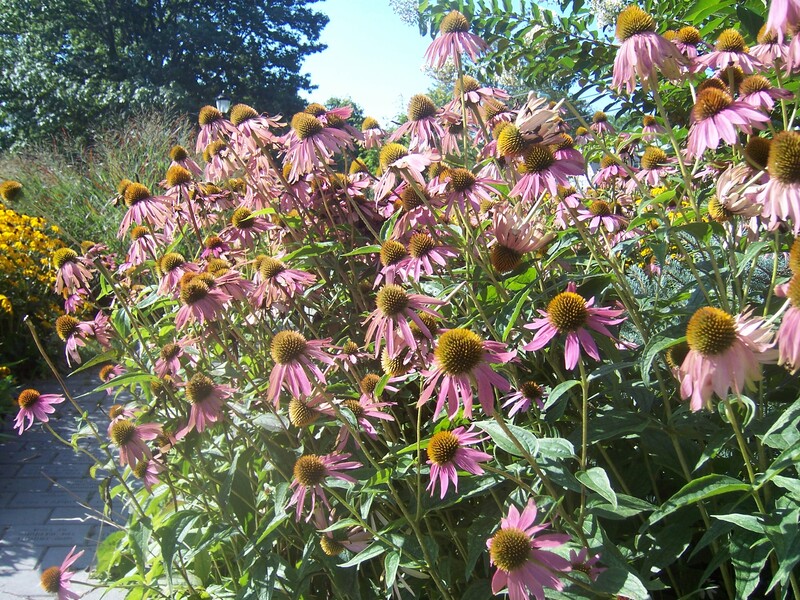 Echinacea along the path to the Peace Labyrinth. and flowering perrenials, all planted by volunteers under the guidance of local master gardener Nancy Angermaier. At the labyrinth’s start is a plaque with instructions on how to walk the circuitous path. With a history dating back thousands of years, the labyrinth is symbolic of life’s journey. While a maze has dead ends, the labyrinth offers the traveler a neverending path. As the journey begins, the walker is faced with twists and turns, each one bringing the individual closer to the center and then sending them further away. 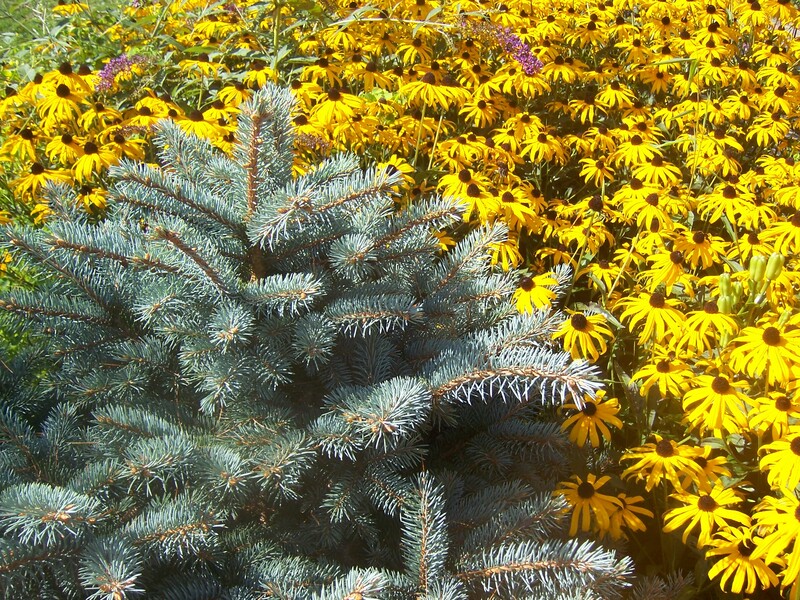 I especially liked the blue of the evergreen and the yellow of the Black-Eyed Susans. Ultimately, the center is reached. The goal is that through a meditative walk, a visitor will feel more calm and centered, maybe even walking away with a solution to something that has weighed heavily upon his or her mind. The Common Ground Park and Peace Labyrinth is a true testament of what a community park can and should be. For more information, please visit their website. 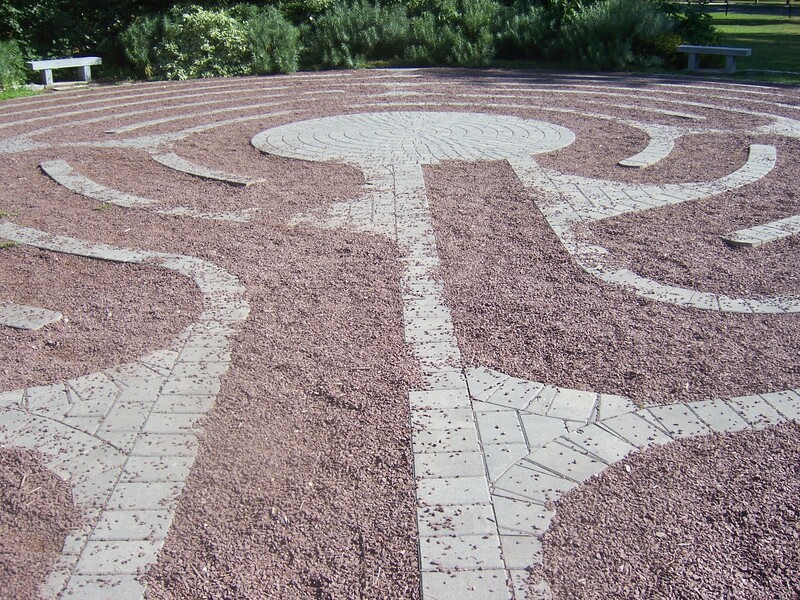 To find a labyrinth garden in your area, check out World-Wide Labyrinth Locator. Special thanks to Suzanne Robilotta, this year’s Common Ground president, for helping me to fill in the gaps. I live in Tuscaloosa, Alabama, a town hard hit by the April 27 tornado. There are plans to build some memorial parks, gardens, etc. to honor the 50 people who lost their lives and we still have a few missing souls. The description of this garden is so beautiful and meaningful. I want to share it with more people. I am a Master Gardener and have been since 1992. First, let me say that I heard about the tornado on the news. All too often, after the storm passes and the news cameras leave, we forget that a community must still rebuild and heal. Please share this story with everyone, and by all means, you can contact the creators through the garden’s website. A garden seems like a perfect way for an entire community to come together and build something with meaning. There is always work for someone, no matter their skill level. Please know that your town is in my thoughts and prayers. Thanks for posting this. It’s always nice to hear stories about community gardens. Here in my country, we call it “bayanihan”. I just wish we also have our very own peace labyrinth. Hello, and thanks for commenting. With a little research, I’m sure you can create a labyrinth garden. Many of the patterns are based on ancient designs, and can be created with stone or grasses or plants. It is definitely a peaceful endeavor. Nice reminder of how gardening connects people. And, a reminder to me that I really need to get going on creating that labyrinth I’ve been thinking of for so many years. Thank you for your feedback. I have to admit, there was definitely a calming effect as I walked the labyrinth. It forces you to slow down and breathe. I hope you’re able to create you labyrinth. I know that when you do, it will be spectacular. Be well. Beautiful garden. I have also wanted to create a labyrinth, but I have not been able to figure out how to create one on a slope…my backyard. These photos are so beautiful. I was surprised at the resources that are available for labyrinth planners, and many of the patterns are based on designs that are hundreds of years old. I wonder of it could be a design based on a tier format, or a pattern where your “center” would be at the top of your slope. Just a thought. This is a wonderful garden and thank you for the visit and all the photos. They have a great philosophy too. I agree. The garden and labyrinth are wonderful, but it’s the spirit of the garden and the philosophy of the group that truly make it beautiful. Thank you for visiting my blog, and for your kind words. I hadn’t come across labyrinth garden before.What an enchanting idea and particularly in a community garden. We have mazes over here usually as part of a large NT gardens because they need so much space and maintenance. Interesting post. Glad you liked the post. From what I’ve read about labyrinths, many of the designs can be found in churches and cathedrals as designs in the floors. Transferring the pattern into a garden brings a spiritual sense to the outdoors. What I enjoyed about walking the labyrinth was the sense of solitude as I journeyed from the start to the center. Where a maze is designed to confuse you because of the dead ends, the labyrinth is supposed to guide you to the center. Thank you for stopping by and commenting. Hopefully, you can start a whole new garden trend in your part of the world. What a beautiful thought! All too often, our lives are so hectic that we rarely take time out of the day to breathe and find some sense of peace and calm. Walking is such a wonderful way to cool off. How often do we tell someone who is angry to go take a walk to calm down. Perhaps we all need to walk, and maybe the world would be a much better place. If you can’t find a labyrinth in your area, there’s nothing wrong with using sidewalks in your hometown. Peace. Thank you for visiting my blog and reading my article on the labyrinth. I just read your article about the local labyrinth you visited and it turns out that it is in my home town…small world. I visit it often…a beautiful serene place. Very nice article on the Common Ground. I enjoyed reading it. Thanks for visiting! Like I said, it is such an amazingly peaceful experience — I wasn’t prepared for my reaction. Cheers!